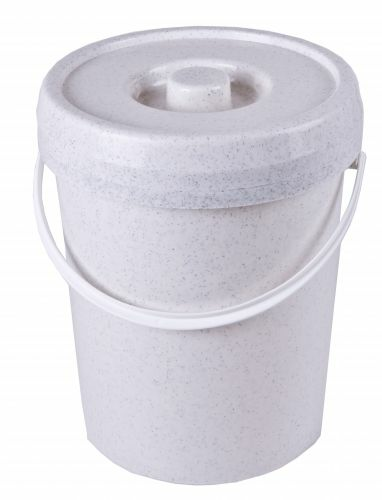 Nappy bucket for storing used cloth nappies until you are ready to put them in the washing machine. Popolini believe responsible parents look for natural, practical and above all healthy products for their children. Sustainability is the key to a better future. Therefore they produce primarily in Europe and use only skin and environmental friendly materials. Their product development is guided by real needs of the parents. Many of their new products result from suggestions of mothers, midwives or their own staff of which the majority have children themselves. It may sound simple but it is very handy to and the lid is great. Finally a good old fashioned nappy bucket, they seem very hard to find in Ireland these days! Good size and reasonable price too. I bought this bin for my reusable nappies. It's large enough to hold about 12 nappies. It seals well enough that there is no smell from the bin. It is also neat to fit into our small bathroom. Great buy and I would recommend as an essential for anyone using resusable nappies. I ordered it on a Wednesday and it was delivered by 8am the next day! Great service!